Welcome to Rosemary Beach! 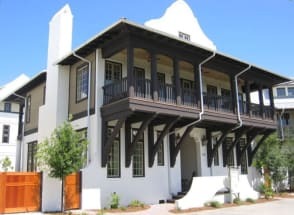 One of 30a's newest coastal dune communities, Rosemary Beach is an architectural treasure chest, with influences from St. Augustine, Charleston, West Indies and New Orleans Charm. These Homes, many with adjacent carriage houses, are connected by a network of Pedestrian Paths and boardwalks which become even more incredible at night as the community boasts soft flickering, gas lanterns on each home and along the boardwalks. You won't be disappointed by the level of luxury and comfort that comes with each of our Rosemary Beach properties. Like Many of the coastal dune communities, the best way to explore Rosemary 100+ acres is by foot or a beach bike. Wood plank walkways meander throughout the towns stunning architecture, revealing hip, swank swimming pools, cascading fountains, a huge tennis club with clay and grass courts, trendy coffee bars, superb wine bars and 3000 feet of gorgeous white sand beach. Emerald Coast by Owner puts you in direct contact with our Rosemary Beach property owners, simply click on the "Email Owner" button found on each listing to send an owner a message. ECBYO does not charge any service fees when you book with us, so book online today and save! We hope you enjoy your stay at Rosemary Beach, Florida. 2BR Home in the Heart of Rosemary.